In a skillet, heat the olive oil over medium heat and add the pancetta. Cook until the pancetta starts to crisp and brown, about 3 to 5 minutes. Remove the pancetta from the pan and set aside. Add the clams, cover, and cook until the clams open, about 5 minutes. 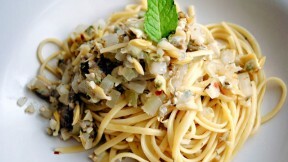 Remove the clams to a bowl and remove from shells, reserving any liquid. Reserve the liquid in the skillet. Cook the pasta until al dente, and drain. When the pasta is cooked, add the pancetta to the skillet you cooked the clams in, along with the garlic, red pepper flakes, and black pepper. Bring to a boil to thicken the liquid slightly. Add the butter and pasta, toss the pasta to heat it through. Add the clams, basil and parsley. Toss again, then serve.